Thirty-three days is now the life expectancy of a police chief in Nuevo Laredo. And actually, in comparison, this chief outlived some of his predecessors. Retired Army Brigadier General Manuel Farfan had served his country honorably. 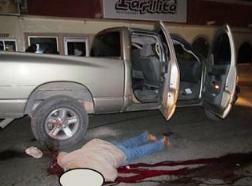 The drug cartels, most likely Los Zetas, were not impressed. I have been covering the violence in this area for several months and reported on the violence in Nuevo Laredo and its impact across the border in Laredo, Texas. January 3rd, the Governor of Tamaulipas appointed General Farfan to become the head of the Nuevo Laredo municipal police. He was one of 11 military officers who were appointed to head police departments in an effort to contain the violent drug cartel groups according to an article in the Nuevo Laredo News. It appears the goal of this program was to begin increasing the professionalism and discipline of the municipal departments. Farfan was gunned down in the center of the city along with four of his body guards and an assistant according to an updated report in the HoyLaredo Noticias. Two of the body guards died later from their wounds. The unnamed spokesman for the Nuevo Laredo Public Safety Department said Farfan had received two death threats via phone during his 33 day tenure. Last month, Gen. Farfan told HoyLaredo his department had identified 50 "coyotes" working around the international bridges of his district. He expressed the difficulty of making arrests in these cases because of reluctance of citizens to disclose information for fear of retaliation. As recently as last week, Gen. Farfan told HoyLaredo he rejected the idea of local police needing military style training. He said that fighting the drug cartels and organized crime was the job of federal officials. The municial police were suppose to "protect and serve" but more on a local citizen to citizen basis. HoyLaredo reported that when the ambush occured, police and military rushed to the scene to help but were chased away by the heavily armed assassins. We will continue to cover the violence in this region. American law enforcement and Homeland Security must be prepared to stop this type of violence from spilling across our borders.